A few days after getting the crap kicked out of me, we played again with the Clash on Broadway. 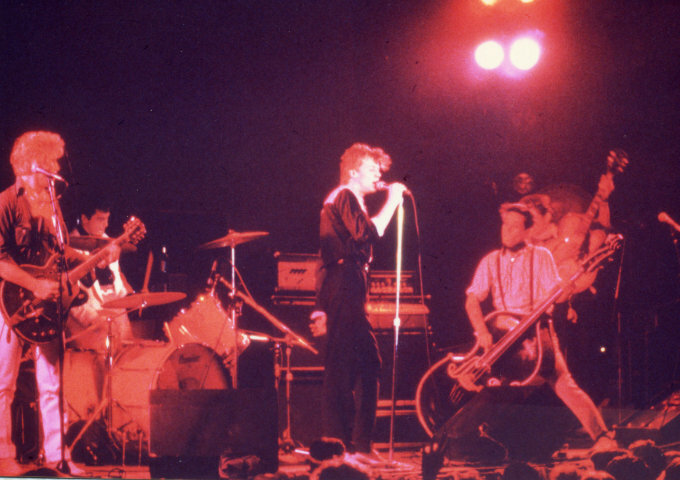 It was a matinee show on June 13th 1981 and I decided to wear the pink Sid Vicious/Jerry Nolan pants. They made me feel like the coolest cat on earth, so why not? It was our 2nd show during the Clash run, so I knew what to expect: no sound check and due to all of the Clash’s gear, I couldn’t fit my whole drum kit on stage without blocking Dibbs’ and Smuts’ dance path. So, the seat cushion had to go on the front of their drum riser so I could sit. As it was so high up off the ground I was practically standing behind the kit. Now this next part is kind of foggy but I swear that as I was playing, blood from my head wounds started to mix with sweat and drip around my ear onto the snare drum. Red droplets would bounce with every thwack. I admit, I may be mixing this gig up with another gig I did with Beat Rodeo in ’86 after cutting a finger on a can of black beans, but surviving a holdup has more of a spectacular ring to it than a simple cut from a tin can. If I’ve learned anything in all of these years is that when in doubt always go with the myth. I realized I had reached a new level of coolness by bleeding on stage. It made me feel an Iggy-like sense of authenticity and worthiness. I had sacrificed blood for the right to rock and roll. I had put my life on the line. I had earned my stripes. Well, it sounded good anyway. After the show, it was still day time. In my sweaty finery I walked a few blocks south to 1500 Broadway at 43d street, the first King Karol Records shop that I worked at a few years before. I went to the back of the store where the tapes were sold and there was Richard Mackler. Richard was older than me and a Jazz drummer. Like that Bowie/Mott song said (kinda), he never got it off on that rock and roll stuff. He had a long beard and hair like Bozo the Clown: bald in the middle but long on the sides. He was funny and friendly though. I admit I came in there not just to say “hi” but to gloat. I was in a Rock and Roll band wearing pink pants, making records and playing on bills with the Clash. I got out of the retail trade and I was on my way man! Richard was taken aback by my appearance, which is what I wanted. We talked a bit until he noticed there was still some blood behind my ears. “You’re bleeding”, he said calmly.